This unassuming joint is tucked away in a strip mall, but don't let its no-frills appearance fool you. Inside you'll find bright sushi rolls made from fish so fresh it's pulled straight from owner Shawn Steadman's boat (affectionately named the Shiso Phat). 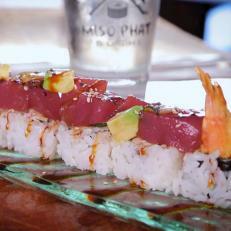 "It's so fresh it's almost jumping into my mouth," Guy said of the TNT, a shrimp tempura roll topped with ahi poke. Another standout is the lilikoi ice cream: a tangy frozen treat made from Hawaiian passion fruit.